WILL THE DEMONS OF THE PAST LET KYLIE AND STONE HAVE A RELATIONSHIP ? OMG A HOT READ!! I received an ARC from the very talented and amazing author Anne L Parks in exchange for an honest opinion. This is Mismousey’s very honest opinion of her book ‘OF DEMONS & STONE “. Having had the pleasure and honor of reading Ms. Parks books before, I am honored to be asked to read and review this amazing and thrilling book in her trilogy. 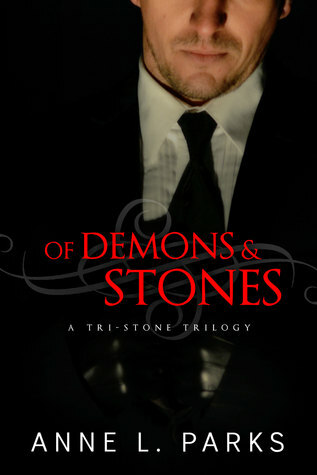 Of Demons & Stones is about is a young defense attorney by the name of Kylie Tate who we met at the met beginning of the story running down the road. She comes across a man who is standing beside his car that has broken down. Now she ask him if he knows whats wrong with – will it turn over or not- does he need to use her cellphone? Kylie has him open his hood and then tells him whats wrong with the car. She then calls her man to tow him. He in turns makes a call on her cellphone. Then she continues her run. The next day at the office- she gets introduced to Mr Stone. ( the Alex Stone) he is need of some assistance with his nephew who needs a defence counsel. He has the files sent to her via email and she calls the DA about reaching an argument with only community service. Josh has to show up in court Monday presentable and do exactly what she says. Mr Stone thanks her. From there the chase is on so to say. As John is a mad hatter when they leave the office that night. He tries to get Kyle to take him back. They argue-the car next door beeps Kylie is able to escape. The following morning Alex Stone is back in the building – matter of fact in the very next room. He texts Kylie and she textes him back. They do this back an forth all morning. Till they break for lunch. Kylie asks her assistant to come into her office for a moment as she needs to speak to her, It’s at that time John starts yelling and wanting to know why she was testing Alex Stone back and forth. Is she now whoring around with him. She tells him to get out of her office. Now they had dated before and it ended it badly very badly. It left demons But they both have demons in there in past, What are they. Will Kylie tell Alex about her demons and what happened to her?? Alex invites her to take a boat a ride and then enjoy an overnight on it. When they get back to shore and she goes to get into her jeep her tires are slashed. Alex is upset about it. He has his driver take her home but she see or thinks she John drive off. Now over the course of a couple weeks Alex and Klyie have started a some what relationship and are living together But once they start living together things start happening, John threatens her at a Gala – tries drugging her at a office party- her house catches fire- a whole lot more. Now I am not going to tell what happens or if Kylie and Alex even stay together. This is something you need to find out for yourself. As this book as so many and I DO MEAN SO MANY TWIST AND TURNS in it . I recommend this book for everyone!!!! BEWARE IT HAS A CLIFF HANGER!! Mismousey gives it a very firm and I do mean firm 70 out 5 out stars!! Yes you read that right – I have gave my first 70 rating !! Now that is saying something about this book. Ms. Parks. you are amazing author – I am looking forward to reading more of your books an more of this series. Please I beg of you don’t make us wait until next year for next book. I have to have MORE NOW!!!! ← ALL LUKE WAS CONCERNED ABOUT HIS SHOP AN HIMSELF AND THEN KI CAME INTO HIS LIFE! !